This little Australian 'Digger's personality shows in his genuine antique leather bootbutton eyes [circa 1902], shined waxed nose, Schulte tufted mohair with trimmed stubbled tufted mohair paddypaws, three quarters ginned cotton and 1 quarter polyester/Visy beads stuffing. Digger's head is wobble-jointed . His hat is fashioned on the original Aussie stockman's hat and is made from rabbit skin /felt . 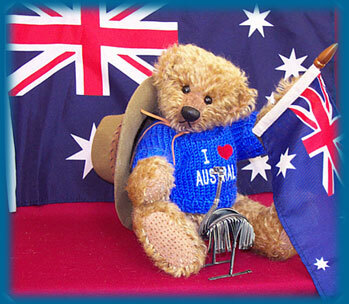 Digger's bright blue jumper has "I love Australia" embroidered on the front and his paw-held flag and the backing flag are part of Digger's auction, as is the unique modelled emu made from sculpted tin by an artist/sculptor from Geraldton, West Oz. 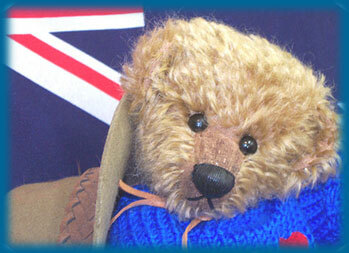 Digger has his own Aussie teddybear passport stamped with Kalgoorlie ,Western Australia where he was designed and made.